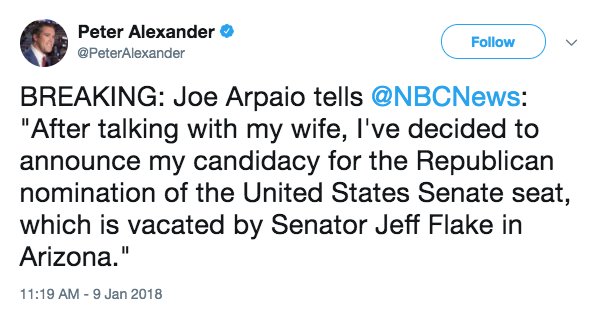 Former Arizona Sheriff Joe Arpaio has announced that he will run for U.S. Senate to hopefully fill the seat vacated by Sen. Jeff Flake, who is retiring. He also wants to support President Donald Trump, Arpaio says. Arpaio, 85, was pardoned by President Trump this past August. Arpaio famously avoided a jail sentence after being convicted of criminal contempt where it concerned his efforts and policies in policing illegal immigrants. 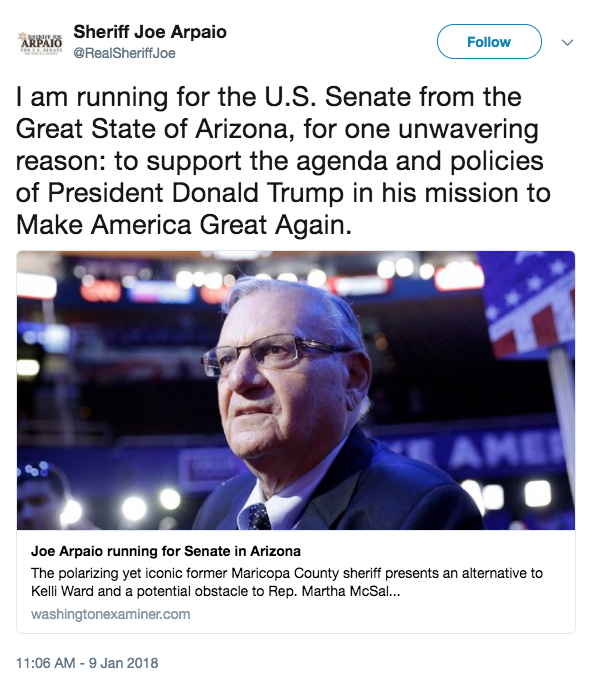 “I am running for the U.S. Senate from the Great State of Arizona, for one unwavering reason: to support the agenda and policies of President Donald Trump in his mission to Make America Great Again [MAGA],” Arpaio wrote on Twitter. Arpaio is the hard-hitting former sheriff from Maricopa County who was bested by a Democrat in the 2016 election after serving for 24 years as sheriff. He was later convicted of criminal contempt for disregarding a court order that said he needed to stop racially profiling Latinos. Arpaio has been a supporter of Trump, especially during the President’s campaign. He told The Washington Examiner that he wants to run for Senate so he can work with the President on behalf of Arizona. Arpaio has a reputation for strongly opposing illegal immigration and using unorthodox law enforcement methods. “Being a U.S. senator is a little different than being the sheriff, because you can do a lot of things in the U.S. Senate, and I have many plans, believe me. It’s tough. It’s a tough decision. But, if you’re going to come across that border, you should be arrested and get the consequences of it,” Arpaio told The Washington Examiner. Arpaio will likely face opposition for the GOP nomination from Kelli Ward and Rep. Martha McSally, who was reportedly going to announce her bid for the Senate seat within a few days.